Shows you how to use Spring-DM to wire together OSGi services to build highly modular and dynamic applications. Spring is a framework that promotes development of looselycoupled/ highly-cohesive objects through dependency injection and interface-oriented design. OSGi is a framework specification that promotes development of loosely-coupled/ highly-cohesive application modules through services and interface-oriented design. Seems like a match made in heaven! Spring Dynamic Modules (Spring-DM) brings Spring and OSGi together to enable a declarative service model for OSGi that leverages Spring’s power of dependency injection. This reference card will be your resource for working with Spring- DM to wire together OSGi services and ultimately building modular applications. You may be interested to know that Spring-DM is the basis for the SpringSource dm Server, a next-generation application server that embraces modularity through OSGi. What’s more, the upcoming OSGi R4.2 specification includes a component model known as the OSGi Blueprint Services that is heavily influenced by Spring-DM. The star player of Spring-DM is a bundle known as the Spring- DM extender. The Spring-DM extender watches for bundles to be installed and inspects them to see if they are Springenabled (that is, if they contain a Spring application context definition file). When it finds a Spring-enabled bundle, the extender will create a Spring application context for the bundle. Spring-DM also provides a Spring configuration namespace that enables you to declare and publish Spring beans as OSGi services and to consume OSGi services as if they were just beans in a Spring application context. This declarative model effectively eliminates the need to work with the OSGi API directly. http://www.springframework.org/osgi. 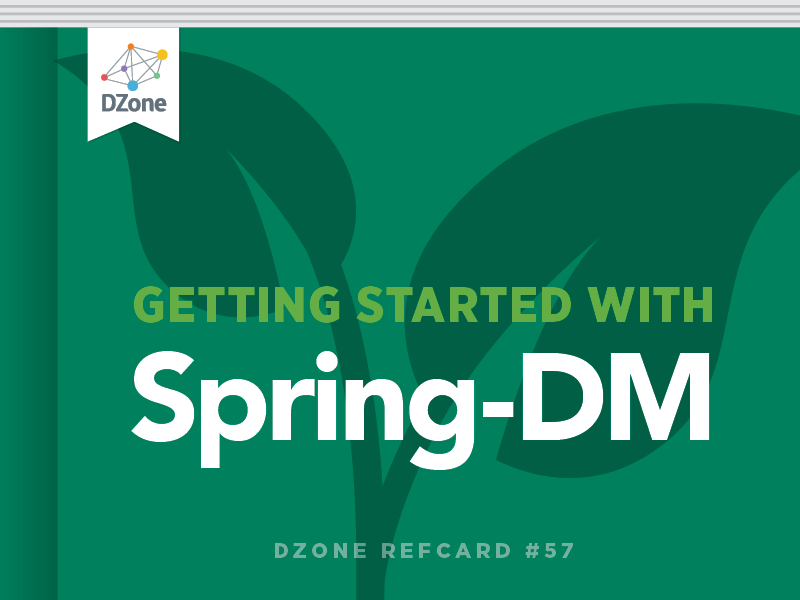 The distribution comes complete with everything you need to work with Spring- DM, including the Spring-DM extender bundle and all of its dependency bundles. When it comes to declaring services and service consumers in Spring-DM, you’ll use Spring-DM’s core namespace. To do that, you’ll need to include the namespace in the XML file. Overriding the context configuration location By default, the Spring-DM extender looks for all XML files located in a bundle’s META-INF/spring folder and assumes that they’re all Spring context definition files that are to be used to create a Spring application context for the bundle; however, if you’d like to put your context definition files elsewhere in the bundle, use the Spring-Context: header in the META-INF/ MANIFEST.MF file. This Spring context file can be named anything, but it should be placed in the Pig Latin translator bundle’s META-INF/ spring directory. When the bundle is started in an OSGi framework, the Spring-DM extender will look for Spring context configuration files in that directory and use them to create a Spring application context for the bundle. Don’t mix your Spring and OSGi contexts Although you can certainly define all of your bundle’s Spring beans and OSGi services in a single Spring context definition file, it’s best to keep them in separate files (all in META-INF/spring). By keeping the OSGi-specific declarations out of the normal Spring context definition, you’ll be able to use the OSGi-free context to do non-OSGi integration tests of your beans. This new Spring context file uses Spring-DM’s element to publish the bean whose ID is “pigLatinTranslator” in the OSGi service registry. The ref attribute refers to the Spring bean in the other context definition file. The interface attribute identifies the interface under which the service will be available in the OSGi service registry. The <service-properties> element can contain one or more <entry> elements from the “beans” namespace. In this case, we’ve added a property named “translator.language” with a value of “Pig Latin”. Later, we’ll use this property to help select this particular service from among a selection of services that all implement Translator. As with the service’s Spring context declaration, the name of this Spring context definition can be named anything, but it should be placed in the client bundle’s META-INF/spring folder so that the Spring-DM extender will find it. The bean is declared with the init-method attribute set to call the go() method when the bean is created. And we use the <property> element to inject the bean’s translator property with a reference to a bean whose ID is “translator”. The big question here is: Where does the “translator” bean come from? When the Spring-DM extender creates a Spring context for the client bundle, it will create a bean with an ID of “translator” that is a proxy to the service it finds in the service registry. With that id attribute and interface, it is quite suitable for wiring into the client bean’s translator property. In a dynamic environment like OSGi, services can come and go. When the client bundle starts up, there may not be a Translator service available for consumption. If it’s not available, then Spring-DM will wait up to 5 minutes for the service to become available before giving up and throwing an exception. Notice that the timeout attribute is specified in milliseconds, so 60000 indicates 60 seconds or 1 minute. Imagine that we have two or more Translator services published in the OSGi service registry. Let’s say that in addition to the Pig Latin translator there’s also another Translator service that translates text into Elmer Fudd speak. How can we ensure that our client gets the Pig Latin service when another implementations may be available? The filter attribute lets us specify properties that will help refine the selection of matching services. In this case, we’re only interested in a service that has its “translator.language” property set to “Pig Latin”. Hopefully, you’re in the habit of writing unit tests for your code. If so, that practice should extend to the code that is contained within your OSGi bundles. Because Spring-DM encourages POJO-based OSGi development, you can continue to write unit-tests for the classes that define and consume OSGi services just like you would for any other non-OSGi code. But it’s also important to write tests that exercise your OSGi services as they’ll be used when deployed in an OSGi container. To accommodate in-OSGi integration testing of bundles, Spring-DM provides AbstractConfigurableBundleCreatorTests, a JUnit 3 base test class from which you can write your bundle tests. What’s fascinating is how tests based on AbstractConfigurableBundleCreatorTests work. When the test is run, it starts up an OSGi framework implementation (Equinox by default) and installs one or more bundles into the framework. Finally, it wraps itself in an on-the-fly bundle and installs itself into the OSGi framework so that it can test bundles as an insider. The getTestBundleNames() method returns an array of Strings where each entry represents a bundle that should be installed into the OSGi framework for the test. The format of each entry is a comma-separated set of values that identify the bundle by its Maven group ID, artifact ID, and version number. So far, our test has a single test method, testOsgiPlatformStarts(). All this method does is test that the OSGi framework has started by asserting that bundleContext (inherited from AbstractConfigurableBundleCreatorTests) is not null. Here we retrieve a ServiceReference from the bundle context and assert that it isn’t null. This means that some implementation of the Translator service has been published in the OSGi service registry. Then, it examines the properties of the service reference and asserts that the “translator.language” property has been set to “Pig Latin”, as we’d expect from how we published the service earlier. One more thing we could test is that the Translator service does what we’d expect it to do. Certainly, this kind of test usually belongs in a unit test. But it’s still good to throw a smoke test its way to make sure that we’re getting the service we’re expecting. This method assumes that by the time it is invoked, the translator property has been set. It first asserts that it is not null and then throws a simple test String at it to test that the service does what we expect. Newcomers will find a thorough introduction to the framework, while experienced Drupal developers will learn best practices for building powerful websites. With Using Drupal, you’ll find concrete and creative solutions for developing the exact community website you have in mind. Modular Java is filled with tips and tricks that will make you a more proficient OSGi and Spring-DM developer. Equipped with the know-how gained from this book, you’ll be able to develop applications that are more robust and agile.